Note: Today is day 16 in my series "30 Days of Thankful." Mommy, wow! I'm a big kid now! I don't when it hit me exactly, but I recently realized that I am a full fledged grown up. Maybe it's because I've had too much time to myself to reflect on everything in my life, but I've been taking an inventory of who I am and what I'm doing and where I'm going, and I don't really like what I see. 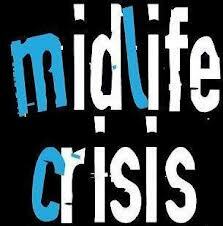 So today, I'm thankful for being in the midst of a midlife crisis. For years and years and years, I was on what I called the Stepford wife/mommy track. I fully expected to be married by now with at least one kid. I'd focused on my career so I could get to a point where I could have some flexibility to work part time if/when I were to have a child. I was SO sure that the road map for life in my head was unrolling in front of me. When in reality, my road map led me right off a cliff. Living as a "me" now rather than a "we" is a whole different ballgame. I'm not going to meet the future Mr. Roxanne in my living room (most likely) so I've been going out more often. And that is kind of a drag. I'm the kind of girl who never liked drinking and partying and staying out late, and to be thrust into this lifestyle that I missed out on 10 years ago when I'm 31 is not so awesome. So what's a girl to do? Besides fret about the future. I have plenty of goals that seem pretty unreachable on my own. But the one thing I do know is that I need to pick myself up, dust myself off, and take one tiny step in front of the other. I have no idea where life is going to take me. Maybe what I thought I wanted isn't really what I wanted after all? One day this will all make sense. And I hope to laugh about this bizarro time in my life where I can't tell right from wrong and up from down. Maybe I'll end up married. Maybe I won't. Maybe I'll run off to a hippie commune in the spring. The future is unwritten. For now, I'm just going to try and enjoy this crazy ride called life.